Whenever someone says “Turkey” – referring to the country, that is, and not the barmy poultry bird – I usually think of Istanbul, the citadel of ancient civilization, or Cappadocia, with its misty hot air balloons at sunrise. More recently, I've associated Turkey with current political events. Either way, Dalaman was never a place that had crossed my mind. The last time I was in Turkey, I was a 9-month-old baby. Having zero recollection of that trip, I knew I specifically wanted to explore more of Turkey in 2018. So when Jet2 reached out and invited me to spend a week in Dalaman, I said YES! Dalaman is a district in the southwestern coast of Turkey, in Muğla. Typically, the area is associated with a riotous party crowd, older British holidaymakers, and all-inclusive resorts. But what I discovered over the week is that the local government and tourism industry have worked incredibly hard to dispel that two-dimensional, primarily unflattering image of Dalaman and have rebranded themselves – quite rightfully – as a destination for the active and inquisitive too. Our trip was split into two parts. 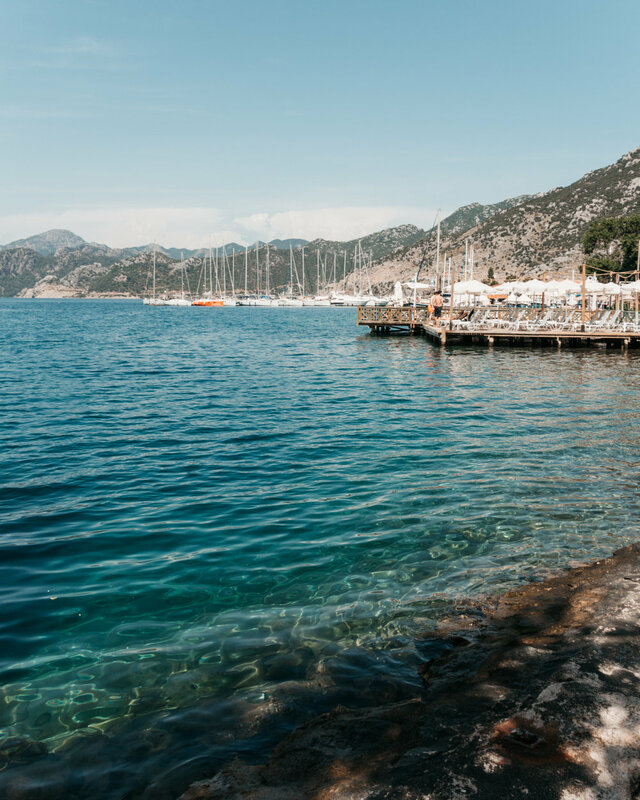 First we stayed at Liberty Hotel Oludeniz and explored Dalaman (Fethiye, Gulet, Göcek, Blue Lagoon, Dalyan, Caretta Beach, Olüdeniz) and then moved to D'Resort Grand Azur to explore Marmaris (Kizkumu, Selimiye, Bayir, Turgut, Akyaka, Azmak, Köycegiz). The loveliest thing about Dalaman is how wonderfully blue the waterscape is. Everyday felt like living in a vintage postcard. 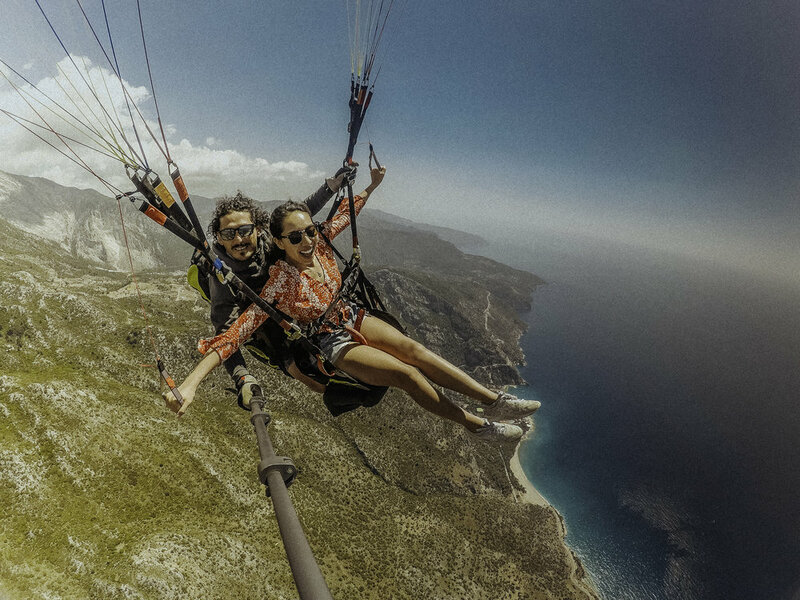 We such great experiences in Dalaman over the week, with paragliding and island hopping being my favourites. 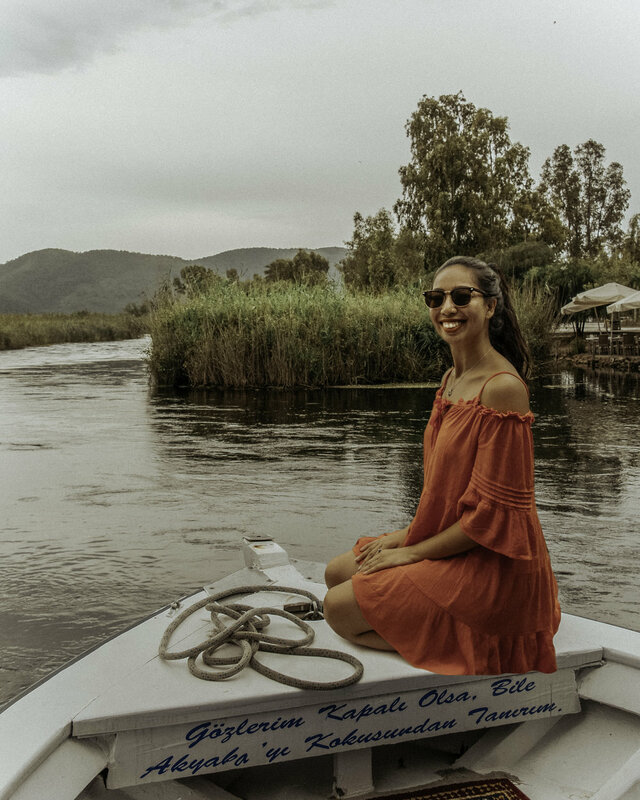 Here are my top 10 things to do during one week in Dalaman, Turkey - and they're all family-friendly! We spent an entire day island hopping via yacht in Göcek, also known as the 12 islands. Göcek is my number one highlight because, if you know me well, I love boat life. We were incredibly lucky with our timing: the weather was perfect (30 degrees celsius, cloudless, with a refreshing breeze) and we virtually had the islands to ourselves. We set sail from Fethiye Port at around 11am. Endless hues of blue from sky and sea surrounded us. We all curled up in various corners of the boat, lulled by the waves. My favourite part of the boat was the deck, where sunbed cushions let us snooze under the sun, listening to the water, catching our Vitamin D.
Each sun-bleached island felt distinctively Mediterranean, and very similar to the stone islands I'd had the pleasure of sailing around in Croatia last year. Every island was full of trees, with crystal clear turquoise waters lapping onto each shore. Jumping in and splashing around in the (freezing at first) water was utterly delightful. For lunch, our boat captain prepared traditional salad and mezze as sides, and grilled some fresh seabass on a barbeque at the back, enjoyed with a chilled glass of crisp white wine. Perfection. If you want that feeling of pure holiday mode and relaxation, this boat trip is the one. Jumping off Babadag mountain and paragliding over the Blue Lagoon is the sort of crazy thing that one always ends up doing in a different country. The reality of what we were about to do – i.e. launch ourselves into potential death with nothing but a parachute to save us – only really dawned on me when our van was halfway up the mountain, and trees had turned into specs of dust. My legs were trembling as we stood on the concrete slope built onto the mountain – one sneeze and I’d tumble to my demise. I stayed calm and focused on everything that my paragliding instructor, Hakan, was telling me as he harnessed me up to the equipment. Next thing I knew, we were running down the slope, the wind caught our parachute, and suddenly, we were floating in the air. It was UNBELIEVABLY THRILLING. Swooping around in the sky, catching the wind, seeing mountain valleys and shimmering blue ocean just below you… there’s something so humbling about it. As I sat in awe of the natural beauty below us, wide-eyed, nose running, full of goosebumps, higher than the clouds, I realised that paragliding was one of the greatest things I have ever had the fortune of doing, and I would love to do it again. It’s terrifying, but ridiculously rewarding. Apparently kids as young as three years old do it – daredevils! A few days into the trip, we visited a thermal mud spa, Dalyan Peloide. What a hoot. You smother yourself in natural or rose oil-infused mud from the outdoor mud baths – scraped up from the ground – and bake in the sun until you look like a human reptile. The mud is supposed to have healing properties and allegedly, Cleopatra herself would make frequent trips to Dalaman just to get her mud fix. I can’t verify this as Cleopatra is no longer around, but I did feel that this little anecdote helped me get into the mindset. After you rinse off, you’re meant to soak in a mineral Sulphur pool for about fifteen minutes. Not sure why, but it felt relaxing. After rinsing the mud off in the outdoor cold showers – which were very welcome after turning into a muddy crisp on a bench – my skin felt so good. Although, my face felt much more sensitive to the sun just afterwards – probably because a layer of skin was exfoliated off. I’ve just stroked my arm again now to test if my skin still feels great – can confirm, soft and smooth. I really recommend doing the mud bath experience, and perhaps a trip to a Turkish Hamam Spa, at the very start of your holiday so your skin is all primed and ready – and so it doesn’t strip away any of the tan you worked so hard on! Muddy fun! As we curved around a bend, we spotted the ancient Lycian Cliff Tombs embedded high up in the mountain rock face. The carvings are incredible, and reminded me of Petra (which I have yet to see in person!). I got a little thrill of historical wonder when the Tombs first appeared in front of us – humanity’s feats are simply marvellous. 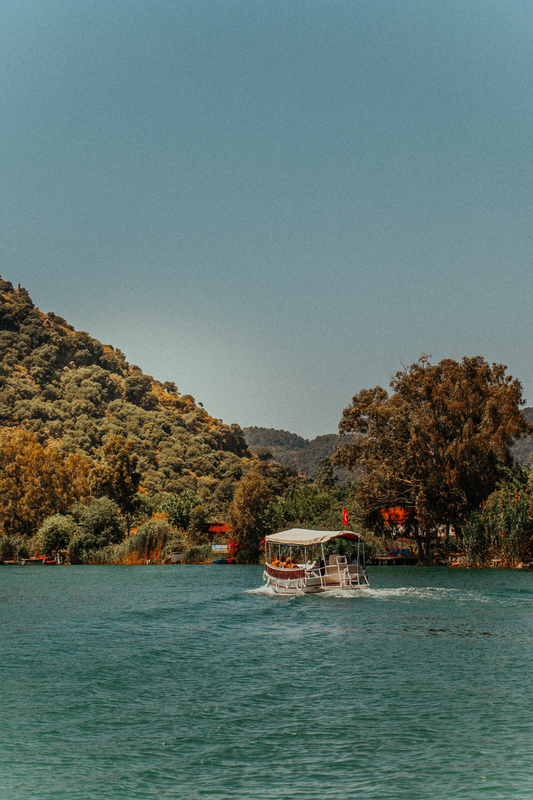 Sitting on top of our boat gave us a beautiful 360 degree panorama of Dalyan’s unique landscape, and provided an even better turtle-spotting position than being on Turtle Beach! I just loved being able to get a new perspective on the region from the water. Our boat snaked through the meandering delta, with mountains and river reeds blossoming before us, and I felt relaxed and content. Seafood, and local cuisine generally, is an utter delight in Dalaman. Fresh, leafy salads and flavoursome stewed vegetables such as aubergines and mushrooms were served at every meal we had. Their desserts are delicious too - I had some of the sweetest strawberries I'd ever tasted there. We wrapped our first evening with a monumental (see: endless) 4-hour dinner of mezze and fresh seafood within Fethiye fish market. You can choose your catch of the day from the sellers and then have it cooked at the restaurants. Plates of aubergine salads, grilled octopus, incredible calamari – the squid was so fresh, and the batter was light and sweet – baked mixed fish, dessert, fresh fruits… they all just kept on coming. We enjoyed the meal with a hilariously strong glass of raki, which is like Greek ouzo, but way stronger! Not for the faint-hearted! 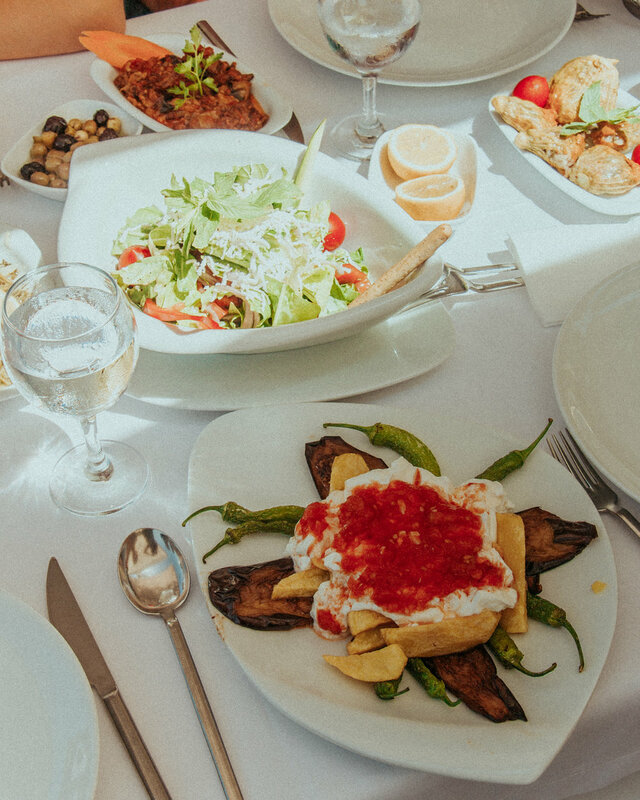 We visited quite a few beautifully located restaurants with good food during our stay - my favourites were Sardunya Restaurant in Selimiye (overlooking a port) and the riverside restaurants in Akyaka. People say that you get to know a place by eating their food. I quite agree! If there's one thing you should do in Dalaman, or any new place you visit, it's try the local food. The Blue Lagoon, a shimmering azure jewel in Öludeniz, is well worth a visit if you're in Dalaman. We flew over the Lagoon for about 40 minutes whilst paragliding, and the colour of the water was mesmerising. It's vividly, 'instagrammably' blue. You can spend a whole day at the Blue Lagoon. There's plenty of things to do, including sunbathing, dipping your toes into the gloriously clear water, renting kayaks and paddling around. I got goosebumps the second we entered 'Ghost Town' — a village in Fethiye that was abandoned in the 19th century. From the 14th century, Greeks and Turks lived harmoniously, side by side in the village, with Greeks calling it "Levissi" and Turks calling it "Kayakoy". Then came a grim combination of terrible historical events: war, the end of the Ottoman Empire, attempted occupations and the deportation of Greek Christians in 1923). Suddenly the people of Kayakoy were uprooted, and the village became barren. I completely recommend seeing this living relic, buried in the heart of Dalaman. I found myself wishing I knew more about its background before visiting so that I could have appreciated the curious energy of the place during the tour. The Selale Waterfalls in the small village of Turgut are an absolute beauty! I highly recommend stopping by here or spending a few hours splashing around if you're headed to Selimiye Port (below). These natural, ice cold turquoise waterfalls cascade from mountainous layers in the rock. We were lucky to explore the waterfalls before it got rammed with people (a boatload of Jeep Safari tourists). If you want to come here and swim or take photos, get to Selale early. I recommend bringing a waterproof GoPro and flip-flops because the water is incredibly deep and easy to fall into. Disclaimer: I totally fell in, fully clothed. Luckily, my gadgets were in my bag which I'd left on the rocks! I highly recommend spending at least a few hours, if not a whole day swimming and relaxing at Selimiye Port because it's so quiet and beautiful. The water is warm, clear and calm - perfect conditions for swimming or standup paddleboarding. The port is extremely accessible, minutes from the main road. We had an incredible lunch at Sardunya Restaurant, right on the water, and then meandered on down to the bay so we could splash around. We rented standup paddleboards from S.U.P. Selimiye Cafe. The lovely owner, who had just sprained her foot in a kite-surfing mishap, was welcoming and knowledgeable. We took it in turns to paddle around the gorgeous, empty harbour. If I am ever lucky enough to have a boat, or sail around Europe for a while, I'd absolutely spend at least one day here. We spent our last day in Akyaka, by the Azmak River. I can't explain how beautiful this river is without showing pictures. 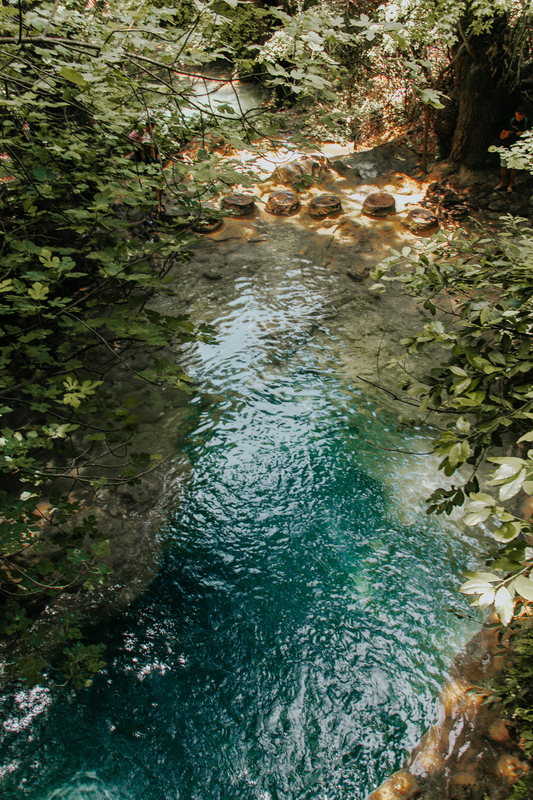 The river is electric green yet crystal clear, teeming with wildlife, from turtles and fish in the waters to birds and ducks nestled in the reeds. We had lunch at a gorgeous riverside restaurant, with the sound of freshwater running beneath our feet and all around us, and baby ducks swimming to and fro. Then, after lunch, we had a relaxing boat ride all along the Azmak River. I really recommend at least having lunch by the Azmak River, because it's such a peaceful area, full of photography and wildlife-spotting opportunities. It was some of the greenest and clearest water I've ever seen! Have you ever been to the Dalaman region before? How did you find it? Leave a comment below! This trip was fully sponsored by Jet2 and Dalaman with Jet2Holidays in partnership with Dalaman Airport. All opinions, however, remain completely honest and my own. Read more from my pals on the trip!